An online first-person shooter introducing a massive multiplayer mode inspired by the Japanese novel/manga Battle Royale and The Hunger Games. We assume the role of the participants of sadistic games held by a race of barbarous, high-tech aliens. Islands of Nyne: Battle Royale for PC, PS4 and XONE is a multiplayer-only first person shooter characteristic for its gameplay modes inspired by The Hunger Games. The game is a debut project of Define Human, a development studio based in United States. 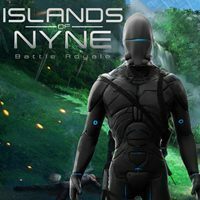 Islands of Nyne: Battle Royale sees us take part in savage battles hosted by a race of evil-minded technologically advanced aliens. Aside from the above, the game completely lacks any story or a singleplayer campaign, instead focusing straight on the multiplayer functionalities. As a result, we are left with a rudimentary universe that serves as means of adding certain science-fiction elements to the game. In short, Islands of Nyne: Battle Royale for PC, PS4 and XONE is a multiplayer-only first person shooter. The players engage in PvP battles using different types of weapons, including firearms and melee weapons. Battle Royale, the game’s primary mode, was inspired by Japanese manga of the same title and is similar to arena matches seen in The Hunger Games. The players are thrown into a huge arena with an objective to defeat other opponents and emerge as the last man standing. Each arena can hold up to 100 players. We are left with three arenas – huge islands filled with various locations and buildings. The islands are surrounded by a deadly plasma field that slowly fastens around the play area, forcing the players to meet in combat. We begin each match airborne and en route to the arena. With a little effort, we can influence the landing zone e.g. in order to avoid other players. Once landed, the players begin to explore the area, searching for weapons, ammunition, medkits, or other useful items, whose locations are random. Moreover, our backpacks have a limited capacity, which forces us to choose items that will be the most useful during further encounters. Each arena contains a number of drivable vehicles. Aside from the flagship Battle Royale, where each player is on their own, Islands of Nyne offers two team-based modes that pit 50 duos or 20 5-person teams against each other.